Fees are per enrolled child for a complete semester of classes. There's no additional charge for additional adults accompanying an enrolled child. Baby siblings under 8 months at registration, and third or additional siblings infants to age 5 are always free with an enrolled child. Please register all siblings who will come to class, regardless if a fee is charged or not. We love our host churches, and we offer a substantial discount for members of many of our host churches. Please contact us if you have a question about whether you qualify for this discount. A complete semester of classes: 3, 4, 6, or 10 weeks depending on the class and time of year. Fees reflect different session lengths. Downloads and a CD with all the songs we'll sing each semester - a different collection of songs for each semester! An illustrated songbook with family activities to enjoy at home. Exclusive access to our online Family Music Zone, with digital downloads for your media player, and additional fun tied to the current collection. Information booklet and additional resources for newly enrolled families. 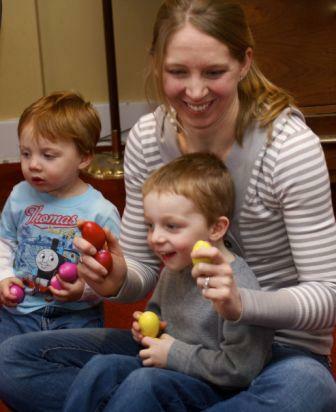 Musical fun with your child, for a lifetime of memories. Share the fun! Save some money! Refer a friend who enrolls for the first time, and you each get $15 off your tuition for one semester. Click here for more information about our friendship discount. Register now! Click here to sign up for our classes.